Lennox X8312 HCXF16-16 Expandable Filter 16x25x5 – Lowest Price! 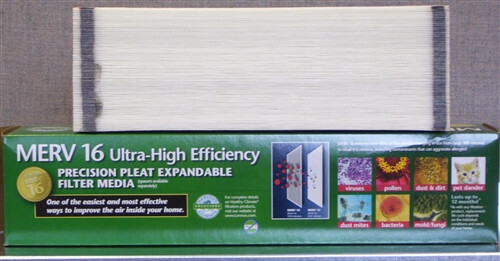 Lennox X8312 - Healthy Climate HCXF16-16 MERV 16 Expandable Filter 16" x 25" x 5"
$107.39 Includes FREE Shipping in Continental U.S.
DiscountfurnaceFilter.com is the web's #1 source for the Lennox X8312 MERV 16 filter. Order your Lennox X8312 MERV 16 filter today and receive fast, efficient, FREE Shipping on Orders Over $125 (Continental U.S.)! One of the easiest ways to keep your bills down, while maintaining your furnace and air conditioning units at the same time, is to regularly swap out old, dirty filters for new ones. Your furnace filter catches dust, hair and other particles, keeping these contaminants away from your furnace blower so that it can heat your home efficiently. Without a clean filter, your furnace has to work harder and use more energy, costing you money. The filter also keeps these contaminants from circulating throughout your home, so that your family is breathing cleaner air. DiscountFurnaceFilter.com offers you guaranteed lowest pricing on furnace filters. Replace your old air filter with a Lennox X8312 filter today to get the best performance from your furnace. We maintain the lowest price on the web for this item! If you find a legitimately lower advertised price on this item (including S&H), Click Here to contact our Sales Department so we can beat the price. You're reviewing: Lennox X8312 - Healthy Climate HCXF16-16 MERV 16 Expandable Filter 16" x 25" x 5"